This quick jack review introduces research done on 5 of the highest rated portable car jacks on the market (including a couple of alternatives to the popular QuickJack brand). These lifts are rated based on quality, weight capacity, safety, price, and other considerations. It is essential to make sure that when looking at a car lift for your garage that all aspects of how and where you will be using it are looked at very closely. Quick jack lifts are a great fit for anyone who is looking for an easy way to gain access to the bottom of their car for maintenance with a minimum of effort and time. Most lifts will raise your vehicle in a matter of seconds, and the safety features will allow you to feel confident when you are working on your car. 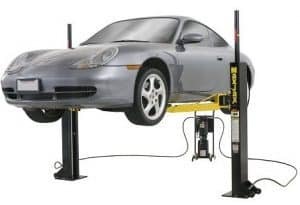 If you have a car that makes it difficult to access the bottom of the vehicle, or if you have an enormous vehicle that needs a special weight capacity, the quick jack lift is your best option. The following review will detail 5 of the highest rated quick jacks on the market and their specific features. At the end of the review, a clear winner will emerge. One of the nice features of the QuickJack BL-5000 is the “remote pendant control” which allows you to adjust the height while moving around the vehicle. This is great for when you want to control the position of the vehicle while you are working on it for detailed maintenance. Another good feature of this lift is the small footprint of the overall unit which makes it very portable and a great space-saving option if you have a smaller garage. The QuickJack has a 3″ clearance capacity which makes it easier to slide under low sitting vehicles unlike other car lifts in the same price range. One of the nice features of the BendPak is the 7000 lb. Capacity that allows you to raise larger vehicles for vehicle maintenance. It is a great feature because your jack won’t become obsolete and need replacing should you decide to move to a van or pickup truck from your sedan. Another great feature of the BendPak is the stability of the vehicle as it is being raised. It really gives you peace of mind when you are lifting a vehicle that weighs thousands of pounds. The BendPak comes with automatic safety latches for added security when raising and lowering a large car or truck. Will lift just about any vehicle because of the maximum capacity of 7000 lbs. One of the great features of the Dannmar is that it is a true 2-post lift and is one of the most stable units on the market, but also gives you the benefit of a smaller, portable unit. Another great feature is that the posts can be individually adjusted to meet your vehicle requirements so it can be customized only for you. The Dannmar has a smaller footprint so it will easily fit into a smaller garage and can be stored easily and with the posts being removable, will not get in the way when you want to move around your garage to work. If you have a little car and want to do some light maintenance, then the BL-3500SLX is the ideal lift for your purposes. One of the good features of this unit is that because it is designed only to hold 3500 lbs, the lift is tiny and compact. The BL-3500SLX can easily be carried and stored in a small back seat or trunk to take with you to the track or another garage. The footprint is also small enough to fit in any small space in your garage if you are challenged in that respect. Another great feature of the BL-3500SLX is that it will lift any small car under 3500 lbs in a matter of seconds and give you free access to the car for maintenance. The Jack Quick is a compact unit that doesn’t lift the entire vehicle, but rather one end. One of the great features of the JackQuick is how little space it takes up and how easily it can be transported. The unique tongue jack works very well for lifting trailers so you can put the hitch on it easily and quickly. The built-in lighting system allows you to do this even when it is dark out, so if you need to unhitch an RV in a dark campground at night, you will find this feature very helpful. Every lift comes with a maximum weight capacity that is safe to have on the lift at one time. Even though demonstrations will show that most 7000 lb. Capacity lifts can lift well over the recommended weight; it is always necessary to follow the manufacturer’s suggestions when it comes to the heaviness of the vehicle you are putting on the lift. Smaller sports cars will probably be fine lifted on a unit with a capacity of 3000-3500 lbs. While a medium or large sedan, van, or pickup should be raised by a 7000-10,000 lb capacity lift. Safety is a vital factor with any equipment, but especially with a piece of equipment that is designed to lift tons of weight up in the air. The ALI (Automotive Lift Institute) publishes a guide that acts a reference for anyone new to using their car lift. 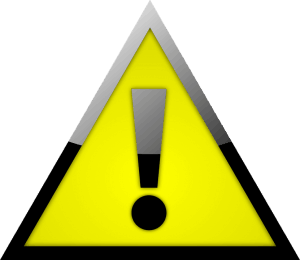 In it, you will find useful information on using your lift, weight requirements, and the best ways to prevent accidents. The safety features of any lift that is shipped in North America comes with very specific guidelines dictated by the ALI and covers over 20 years worth of vehicles and their specific lift standards. If your lift doesn’t come with this guide, it would be a good idea to download it online from autolift.org. When you are raising a 3000 lb. Car into the air, you don’t want the added distraction of trying to figure out the controls of your lift. While most car lifts seem to be intuitive and simple to use, it is always an excellent idea to study the manual and read up on the control settings before you start to use the vehicle. One of the common complaints of the old style car jacks was how difficult it was to get from one point of the car to the other underneath. Often, you would need to wheel around the underside of the vehicle around the wheels to get to every access point you needed to work on. Undercar access on lift is crucial because it gives you the freedom to perform maintenance on your vehicle without having to stop in the middle and move positions. The price – make sure that what you are paying for is worth the features. Some quick jacks claim they have extra features that are worth a price hike. 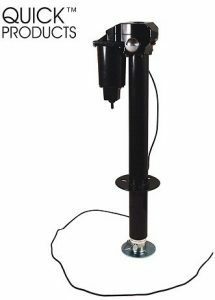 The features – hand in hand with price are the features of the car lift / quick jack model you are looking at. If you have a little car and don’t intend on getting anything larger, then a 7000 lb capacity may not be what you need and you can spend the extra money on better features in a smaller size lift. Dimensions of your garage – make sure you have enough clearance for your vehicle as it is being raised and that the floor will support the pressure. The clear winner is the QuickJack 5175376 BL-5000SLX Car Lift. This lift will raise up to 5000 pounds so unless you decide to upgrade your vehicle, will last for a long time. The remote control means that you have more power over the clearance height than any other lift in this category, and makes it much easier to use. The QuickJack comes with added security features in the form of a dual-locking system which locks the mechanism as you raise and lower the vehicle. This system gives you that added layer of protection for peace of mind. You will not go wrong with the versatility and safety if you choose this lift for your vehicle maintenance needs.